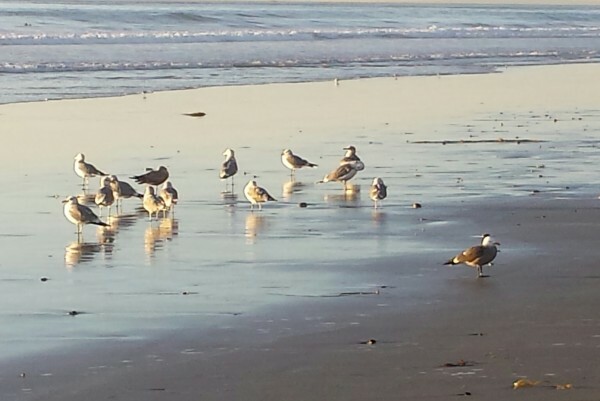 The gulls were in town meeting again today, with the skitterers mingling inconspicuously. I wonder what they discuss and how they vote. There are nearly always an even number in a group, although the brown ones tend to disappear with convincing camouflage into the stones when that’s their meeting place, and I may sometimes miss counting them. I’ve never thought of myself as much of a naturalist, or that observant of “wildlife.” The water slows me down, though. On the way back up the beach staircase, I stopped to talk with a couple visiting from Britain. Portsmouth. Much colder than here, they said! We talked about jobs and travel and restaurants and I almost asked them over to eat dinner at our house. They are staying at the hotel across the street. I was worried they wouldn’t know how to say no if they didn’t want to; I was worried I wouldn’t be relaxed enough to suddenly have two more, strangers at that, at dinner; I was worried they might be axe murderers (Kate?!) When I got home, I was disappointed that I hadn’t asked them anyway. An opportunity lost. Next time, I shall just do it.